I'm just going to come straight out and say that on the cheesy barometer, monogrammed glassware ranks somewhat high in goo. But you know what? Whatever. Because when you're desperate to find that perfect gift for the person that has ev-er-ree-thing, this fits the frickin' bill. Monogram the initial of your friend's last name, your friend's pet's name, your friend's twitter handle. It really doesn't matter. 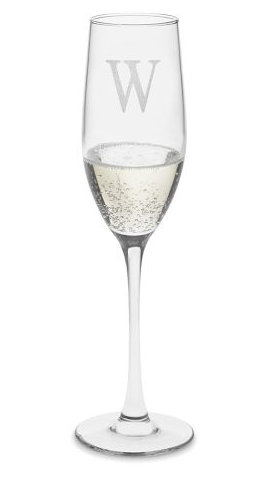 At the end of the day, he or she will be genuinely thrilled to receive these classic Champagne glasses (set of four) from Williams-Sonoma for a marvelous $59.00. P.S. Ignore the drab photo. In real life it's way more sparkly.